Coconut milk is not actually milk, but a liquid stored within the meat of the coconut. Take the coconut meat and blend it. Now strain it using a cheesecloth. Thick coconut milk will naturally leak out. Coconut milk is rich in saturated fats as well as calories. But you will be amazed to find health benefits of coconut milk and its role in weight reduction, improving skin, hair and boosting immunity. Coconut milk is rich in saturated fats as well as calories. But you will be amazed to find health benefits of coconut milk and its role in weight reduction, improving skin, hair and boosting immunity. 1. Coconut milk for a healthy heart– Coconut milk contains Lauric acid that improves the level of cholesterol in the blood. Minerals present in the coconut milk, such as magnesium control the flow of the blood. It improves the blood circulation and lowers the blood pressure. Also, magnesium keeps the blood vessels elastic and prevents the formation of plaque thus reducing the risk of heart attack. 2. Strengthening the immune system- Lauric acid present in the coconut milk is antifungal, antibacterial and antiviral. When it enters the body, it converts into Monolaurin that fights against bacteria and virus that causes influenza, herpes, and HIV. 3. Reducing weight- Coconut milk increases metabolic function that enhances weight loss. It also enhances the function of liver and kidney and keeps the body hydrated and detoxes waste, thus considered as the fat burning and detoxification food. 4. Anti-ageing- Coconut milk contains copper and vitamin C that maintains elasticity of the blood vessels and skin. It slows down the process of aging. 5. Treating arthritis- Selenium present in coconut milk is an antioxidant. Antioxidants fight against free radicals and prevents inflammation. 6. Strengthens bone- Coconut milk is rich in calcium and phosphorus and both minerals promote bone growth in children and strengthens the bone. 7. Coconut milk for hair- Massage your scalp for about 3 to 5 minutes with coconut milk. Shampoo your hair after 20 minutes. This procedure is very helpful in nourishing hair and stimulates the growth of the hair. It also helps to restore damaged hair and split ends. – Mix 50 ml coconut milk with 100ml plain water and 2 tablespoons camphor solution. Massage your scalp with this mixture. After few hours take a head wash. Repeat this process daily to prevent balding. -You can also rub some coconut milk to your hair to detangle hair easily. -Take shampoo and coconut milk in equal amount and mix it. Now apply this on your hair and wash your hair. Coconut milk acts as a natural conditioner. 8. Prevents fatigue- Coconut milk is rich in minerals and electrolyte. It prevents diarrhea, Exhaustion, heat stroke, cramps, and dehydration. 9. Prevents anemia- Coconut milk prevents anemia as it is rich in iron. 10. For healthy skin- Coconut milk is rich in vitamin A, Vitamin C, minerals and natural proteins that make skin smooth and glowing. -Take 1 cup of coconut milk and a half cup of rose water in the bathtub. Immerse yourself in the bathtub for 15 to 20 minutes to moisturize your skin. -You can also apply coconut milk to the sunburnt area to ease pain and rashes. 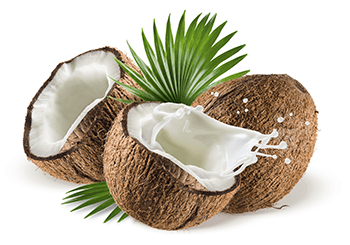 Coconut milk is very easy to extract and is easily available in the market.